Tamworth Road, Dosthill - Mark Webster & Co.
***SUPERB 4 BED DETACHED HOUSE IN DOSTHILL***CONSERVATORY***UTILITY***DOUBLE GARAGE*** Mark Webster Lettings are delighted to offer for let this large detached house in Dosthill. 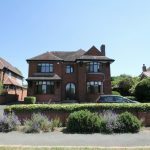 In brief the property offers: - lounge, dining room, large breakfast kitchen, large conservatory, utility, guest wc, 3 double bedrooms and fourth large single, 2 x ensuite shower rooms, main bathroom. Large extensive mature gardens to the front and rear with weekly lawn treatment included, in and out driveway driveway, double garage. Small pets may be considered but NO DSS. Mark Webster & Company are delighted to be able to offer for let this quite superb bay fronted detached property standing on a large plot on this desirable Tamworth Road in Dosthill. Internal viewing of this very well cared for home is considered essential to appreciate the range of accommodation on offer. The accommodation briefly comprises: Reception porch, impressive entrance hall, lounge, dining room, sitting room, large family kitchen, inner lobby area, guest cloakroom/WC, small utility area, good sized rear conservatory, landing, four bedrooms (two with en-suite), family bathroom, gas central heating, detached double garage, large in and out driveway and stunning large gardens. Having attractive arched wooden double opening glazed doors, tiled floor, high level wall light, wooden door with attractive leaded lights glazed insert and adjoining side window leading to the reception hall. (18'2" maximum into the bay window) Ceiling light point, coving to ceiling cornices, three wall lights, leaded lights double glazed bay window to front aspect, leaded light double glazed picture window to side aspect, T.V. aerial point, feature fireplace with inset log effect gas fire having a marble back and hearth, decorative dado rail, single panelled radiator and double panelled radiator. Dining Room 12'10" x 11'9"
(13'9" maximum into the bay window) Ceiling light point, coving to ceiling, picture rail, double panelled radiator, single panelled radiator, leaded lights double glazed bay window to front aspect, leaded lights double glazed picture window to side aspect and delightful feature tiled fireplace with period style wooden surround. Sitting Room 13'9" x 12'9"
Ceiling light point, coving to ceiling cornices, picture rail, leaded lights double glazed picture window to side aspect, leaded lights double glazed picture window to side aspect, double panelled radiator, T.V. aerial point, three wall lights, superb feature tiled fireplace with decorative period style wooden surround and having an inset coal effect gas fire & single radiator. Impressive Breakfast Kitchen 19'10" x 12'4"
Having recessed ceiling down lighters, coving to ceiling cornices, attractive tiled floor, double panelled radiator, leaded lights double glazed window to side aspect, leaded lights glazed door leading out to the side parking area and double garage, glazed bi-folding doors to the conservatory, extensive range of fitted oak base and eye level units, decorative cornice surround to the eye level units, dresser style unit with glass fronted display cabinet with lighting, corner display shelving, base level wine bottle holder, tall unit housing the double oven, granite work tops with matching up stands, attractive tiling above the up stands, recessed double sink unit and vegetable drainer and leaded lights glazed door leading to the inner lobby area. Recessed ceiling spot light, tiled floor, door to the WC and further door to the small utility area. Recessed ceiling down lighters, opaque leaded lights double glazed window to rear aspect, low level WC, wash basin and tiling to full height. Utility Area 5'4" x 4'2"
Two recessed ceiling spot lights, access to the roof storage space, tiled floor, opaque leaded lights double glazed window to rear aspect, central heating boiler and space and plumbing for an automatic washing machine. Superb Conservatory 21'7" x 9'5"
Having a Victorian style glass roof, upvc double glazed windows overlooking the stunning large rear garden ,attractive tiled floor that continues from the kitchen (under floor heating), three wall lights, combined ceiling light and fan and two pairs of upvc double glazed French doors. Bedroom One 12'9" x 11'9"
(14'1" maximum into the bay window) Ceiling light point, coving to ceiling cornices, leaded lights double glazed bay window to front aspect, double panelled radiator and picture rail. Bedroom Two 13'8" x 9'9"
(12'9" maximum into the door recess) Ceiling light point, coving to ceiling cornices, picture rail, leaded lights double glazed window to rear aspect, leaded lights double glazed window to side aspect, double panelled radiator and arched opening leading to the en-suite. Ceiling light point, coving to ceiling cornices, tiled floor, low level WC, pedestal wash hand basin, tiled shower cubicle and extractor fan. Bedroom Three 11'10" x 9'8"
Recessed ceiling down lighters, coving to ceiling cornices, leaded lights double glazed window to front aspect, fitted wardrobes and drawers, window seat, radiator and canopy spot light over the bed area. (7'8" maximum into the door recess) Ceiling light point, opaque leaded lights double glazed window to rear aspect, low level WC, pedestal wash hand basin, wall light, single panelled radiator, tiled shower cubicle, tiled walls and floor. Bedroom Four 7'9" x 6'7"
Ceiling light point, picture rail, double panelled radiator, leaded lights double glazed window to front aspect and range of fitted office furniture. Family Bathroom 7'8" x 6'5"
Recessed ceiling down lighters, coving to ceiling cornices, single panelled radiator, tiled floor, attractive opaque leaded lights double glazed window to rear aspect, low level WC, pedestal wash hand basin, bath with gold effect mixer style tap with shower attachment, tiling to half height with dado rail border, two wall lights and towel radiator. 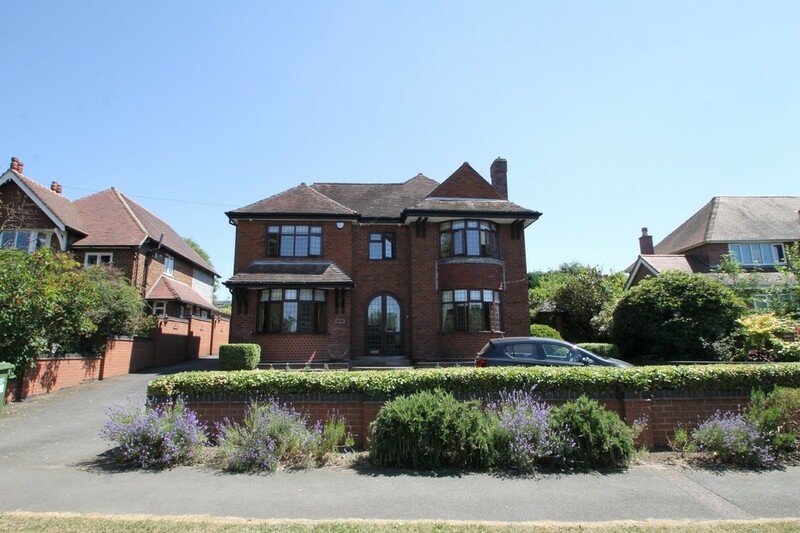 The property has a delightful approach off the Tamworth Road via and in out driveway providing ample road parking, further parking to the side and rear that also gives access to the detached double garage, attractive planted borders and side gated access to the very impressive rear garden. The rear garden is one of the best gardens we have seen (comment by Mark Webster) being very well cared for having a full width patio area, feature rockery and fish pond, well established borders, well cared for lawn areas, sweeping paved pathway that leads to a rear summer house. Detached Double Garage 18'2" x 17'5"
Having an electric up and over door with remote control fob, opaque glazed window to side aspect, glazed rear door, roof storage space, power and light.